Kolelinia—a system that allows you to ride your bike above the traffic—looks like a crazy idea until you check out the engineering behind it. Then you will realize that it's not only cool, but it can work too. Kolelinia has two elements, a half-pipe—this is where your bike's wheels run—and a cable above that pipe. 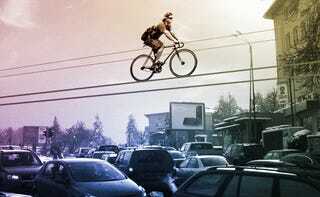 The cable is at the same height as your bike's handles, and it provides stability and safety while you fly over the cars. The cable connects to the bike's handle using a special hooking device. This divoce also has a hole for a carabiner, so you can use a harness and safety line for extra safety.